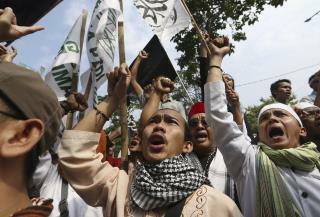 (Newser) – An Indonesian court sentenced the minority Christian governor of Jakarta to two years in prison on Tuesday for blaspheming the Koran, a jarring ruling that undermines the reputation of the world's largest Muslim nation for practicing a moderate form of Islam. In announcing its decision, the five-judge panel said Gov. Basuki "Ahok" Tjahaja Purnama was "convincingly proven guilty of blasphemy" and ordered his arrest, the AP reports. He was taken to Cipinang Prison in East Jakarta. Photos quickly appeared online of Ahok, who still commands immense popularity in Jakarta, the capital, being warmly greeted by prison staff. Ahok says he'll appeal, but it's unclear whether he'll be released during the process. Basic christianity is forgiveness and is based on the golden rule What would go wrong if people treated everyone the way they wanted to be treated. They removed him because he wasn't corrupt like a typical politician.